To provide clear and professional looking windows/mirrors for commercial and residential environments. 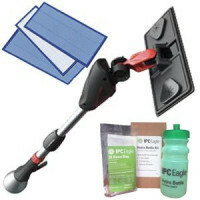 Gather all the necessary glass cleaning supplies and take them to the general area that needs cleaning. For interior windows, or exterior ones that are found on the ground floor, a janitorial cart with the necessary supplies, or a window cleaning kit, like our basic window cleaning kit may be all that you need. For windows higher up on a multi-story building, one of our deionized window washing kits may be the optimum alternative, compared to using ladders or powered lifts. This eliminates the risk of an accident happening on the job. Using a window washing sleeve or a spray bottle, coat your window with a thin coat of solution. The window washing sleeve will work better on heavily soiled windows, because it will remove dirt, smudges and other marks quickly and efficiently. Take your squeegee and gently press the left most portion of the squeegee up tight against the left frame of the window. You'll want to angle your squeegee so only about 1 inch or so of the squeegee is touching the window. With some force, drag the squeegee down creating a 1 inch barrier from the window frame and the area to be squeegeed. 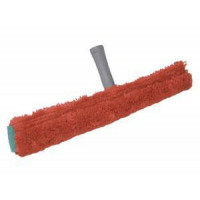 Wipe off your squeegee blade with a towel. Starting in the upper left corner, pull your squeegee straight across at about a 45° angle. As you hit the right frame of the window, slowly start to turn the angle at which you squeegee is on the glass to start an "S" like motion to come back with. You will continue to use this motion until you reach the bottom of the window and can run your squeegee across the bottom of the frame, cleaning the last of the window. While you are doing these steps, it is a good idea to use consistent pressure, and to always have 95% of your squeegee on a wet surface. This will make the squeegee blades last longer. Also, you never want to have the squeegee blade leave the window during cleaning, as this can create a line, and you'll have to start all over if you want perfectly spotless windows. Use the included TDS (total dissolved solids) water meter to measure the amount of particles in the water. 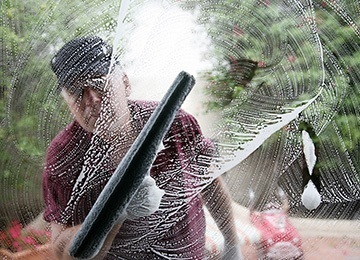 If the water is not pure, these impurities will stick to your window after cleaning. Maintain a 20° angle while resting the brush head again your window. This will take most of the pressure off of you and transfer it to the window. Start cleaning by spraying the deionized water into the corners of the window frame, and rinsing the window from the top down. Using a "Z" motion, continue to rinse the window until you reach the bottom of the frame. Scrub the window thoroughly, and then rinse once more. Because you're using pure water, the window can then dry and will be perfectly clean (because the deionized water is pure and holds no impurities to stick to the window). If you're cleaning by hand, take your rag and wipe down the window frame to pick up any water/solution that may have been missed or sprayed onto the sill by accident. Rinse out your rags. Wipe down your squeegee and hang it, as well as your rags, up to dry. Wash out all buckets and equipment.